Answer: NLP and hypnotic language–sleight of mouth patterns, covert & conversational hypnotic language and metaphor. 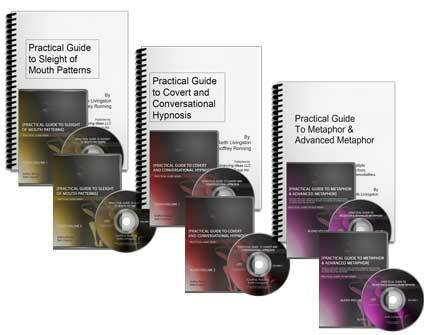 The Hypnotic Language Mastery Pack includes the Practical Guide to Covert & Conversational Hypnosis (the Milton Model), the Practical Guide to Sleight of Mouth AND the Practical Guide to Metaphor and Advanced Metaphor.Each of these individual programs includes two audio CDs worth of powerful, effective and practical NLP and hypnotic language patterns plus a comprehensive workbook designed to skyrocket your persuasion, influence, NLP and hypnotic language skills. 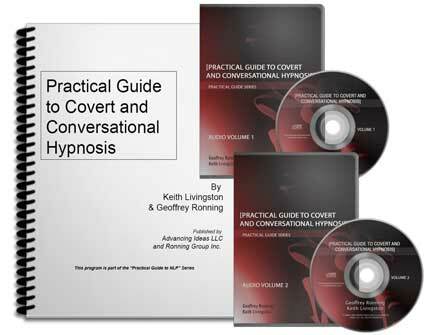 Covert & Conversational Hypnosis: hypnotic language patterns from the greatest hypnotherapist who ever lived. Sleight of Mouth: patterns to dissolve limiting beliefs that get in the way of your communication. Metaphor: weave stories that almost magically create whatever feelings you want to create, in people you interact with. I've sold this program to hundreds of hypnotherapists. You learn the secrets hypnotherapists and NLP practitioners use to boost their persuasion and influence skills and get powerful, long-lasting results in record time. Six CDs worth of material: Over 4 hours of laser-focused audio featuring top-notch, master-practitioner level NLP and hypnotic language instruction. Delivered in a relaxed, conversational style, you'll be using the patterns in no time. Over 80 pages of patterns, examples and explanations, allowing you to easily absorb and use these exciting techniques. Paint-by-the-numbers exercises to make it simple to quickly build your skill to the master level. You'll Be Spinning Out These Valuable Language Patterns, Getting More Of What You Want In Life And Being Able To Help People More Effectively In No Time! These programs combine the most critical and useful NLP & hypnotic tools, tricks and patterns and the way it's organized makes it easy for you to quickly and easily absorb the material in a deeper way. 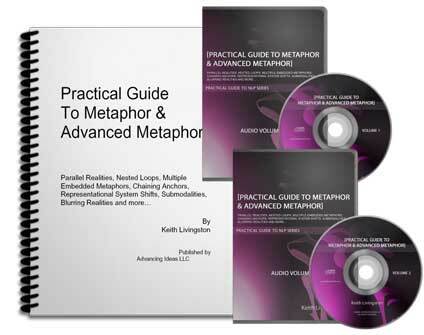 The greatest aspect of Keith’s “Practical Guide to Covert & Conversational Hypnosis, Sleight of Mouth and Metaphor” package is just how complete you will discover it is. In my experience, this is the one and only package to combine all of the most critical NLP skills in three powerful and concise lesson plans. The audio portions allow me to listen time after time after time – so I absorb the material deeper and deeper as I listen to them again and again. Thank you Keith! Master the incredible power of Milton Erickson’s covert and conversational hypnotic language patterns. Each language pattern is a valuable tool for hypnotically opening up the mind to new possibilities. Using these ultra high-level techniques you can gain trust and credibility, turbo-charge the feeling of connection others have for you, melt objections away and truly, deeply engage the unconscious mind. Parallel Realities, Nested Loops, Multiple Embedded Metaphors, Chaining Anchors, Representational System Shifts, Submodalities, Blurring Realities. Learn the mind-bogglinghypnotic power thatcults,religions andgovernments use to propel key lessons, communications and instructions deep into people’s unconscious minds. Boost the power and effectiveness of your messages today. Everything you need to learn and start using these advanced NLP language patterns right away. Each sleight of mouth pattern is a tool for persuasion and to dissolve limiting beliefs that could be getting in your way. Why are they called “sleight of mouth?” Because, when done well they work like magic in dissolving objections and limiting beliefs! It’s like sleight of hand for the mind. I just finished listening to the full Sleight of Mouth tutorial, and just wanted to express my deepest thanks, for not just providing the information on what one must learn, but for also providing very specific information on how one can easily learn the material step by step in a methodical fashion. What separates your training from so many others is that most other training provides an overwhelming information dump, leaving it to the trainee to figure out how to parse and chunk it so it can be learned and applied, which is often no easy task. Your and Geoff’s training, on the other hand, not only leads the listener through the relevant information, but then provides detailed steps for the individual so he/she can easily master it a manageable chunk at a time, ultimately learning the material effectively and thoroughly. All the great information in the world is no good if it can’t be managed, and your training provides that missing link so that it can be managed effectively. I will be buying more of your stuff for sure. I’ve sold tons of these programs to hypnotherapists, NLP practitioners, master practitioners and trainers. Add up the list price for these programs and they’d run you $249.85. And as a bundle, you get these programs for only $217 (only $169 for the digital version). Shipped to your door. Six audio CDs in amray casess, and three workbooks.